(PhysOrg.com) -- Mars has slipped far enough behind the sun today that signals from Mars-orbiting spacecraft are effectively blocked until mid-December. This solar conjunction happens every two years. Mars mission scientists – including the University of Arizona-based team that runs the High-Resolution Imaging Science Experiment, or HiRISE, instrument aboard NASA's Mars Reconnaissance Orbiter – will resume operations three weeks from now. But for NASA's UA-led Phoenix Mars Mission, the first university-led mission to Mars, surface science operations are over. The champion little robot was to have photographed, dug and tested samples in the Martian arctic for 90 days after landing on May 25, 2008. 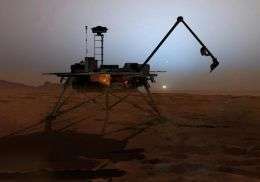 Not only did the Phoenix Mars Lander achieve full mission success in August, it worked for a total 151 Martian days, until Oct. 27, when it was walloped by a dust storm that filled the sky with fine dust that persisted for days. Drained of battery power because too little sunlight reached its two solar panels, Phoenix successfully sent its last signal to the mission team on Sunday, Nov. 2. "This has been a great experience in my life, not only for the wonderful science return but for the tremendous team work that we've developed over the years of the mission," Peter Smith of the UA Lunar and Planetary Laboratory, Phoenix principal investigator, said in a Nov. 10 media teleconference that announced Phoenix surface operations had ended. "It's been a great mission. It's been seven years of my life and definitely a major part of my science career. I'm just thrilled about what we've been able to do." The UA led the $420 million Phoenix mission and $8 million mission extensions with project management at NASA's Jet Propulsion Laboratory in Pasadena, Calif, and development partnership at Lockheed Martin Corp., Denver. International partners are the Canadian Space Agency; the University of Neuchatel, Switzerland; the universities of Copenhagan and Aarhus in Denmark; the Max Planck Institute in Germany; the Finnish Meteorological Institute; and Imperial College of London. -- Touching water ice on Mars for the first time. "When we landed, we looked around and saw a field of dirt and rock that spread out to the horizon," Smith said. "We didn't see ice right away. Then we looked under the lander and saw we were standing on it. Studying that ice has kept us busy for the last five months. We've excavated to the ice, we know its depth, we know how it changes over the surface. The mission is all about water, and studying ice is going to keep us busy for some time." -- Taking 25,000 pictures, from sweeping panoramic vistas, to close-ups of ice and soil in trenches and in the robotic arm scoop, to microscopic close-ups of soil grains, to even higher-resolution close-ups taken down to the atomic level. Phoenix was the first to use an atomic force microscope on another planet. -- Compiling a complete weather record that covered every Martian day, or sol, of the mission. Very sophisticated instruments collected information on clouds, pressure, temperature, winds, and humidity. "You cannot study a surface and an ice layer without knowing the atmosphere above it, and we have a huge volume of data that describes weather for the entire time we conducted surface operations," Smith said. "This is one of the major accomplishments of the mission." At the end of the surface mission, Phoenix saw, for the first time, water as snow falling to the surface Mars and frost on the ground. Falling snow was a real surprise. -- Finding that soil at the landing site is alkaline and contains carbonates and clays. "On Earth, we would immediately conclude that there was liquid water in this soil," Smith said. "From Mars, we have to be a little more careful to develop the story as we can, as we interpret our data. But definitely, liquid water has been a part of this soil." -- Finding that soil at the landing site contain small concentrations of salts and perchlorate. Such soluble salts as potassium, sodium, magnesium and chlorine are nutrients for life. Perchlorate is an energy source for microbes on Earth. Discovering nutrients and energy sources is important to answering the question, is the landing site area a habitable zone? "Even if this site isn't habitable now," Smith said, "could this be a place where life could exist as the planet's polar spin axis tilts more towards the sun and the climate warms?" The Phoenix team is studying their data in more detail for the answers. The UA won the 2007 and the 2008 Governor's Innovator of the Year Award in the academia category for leading the Phoenix mission. The mission also won Popular Mechanics magazine's 2008 Breakthrough Award for Innovation, the 2008 Civil Space Award from the California Space Authority, the 2008 National Space Club Astronautics Engineer Award and Popular Science magazine's 2008 Best of What's New Grand Award in the aviation and space category. Steam-propelled spacecraft prototype can theoretically explore celestial objects "forever"